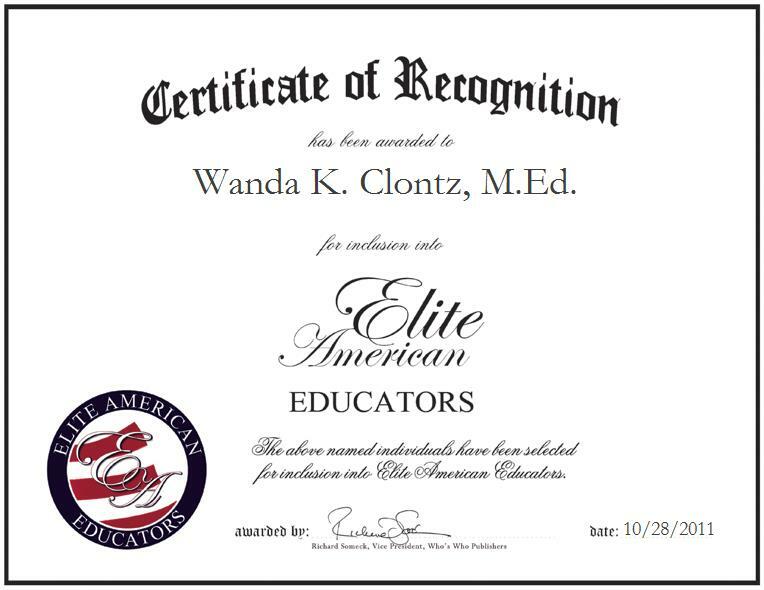 CHARLOTTE, NC, October 28, 2011, Wanda K. Clontz, M.Ed., Teacher at the Bethlehem Center of Charlotte, has been recognized by Elite American Educators for dedication, achievements, and leadership in special education. Ms. Clontz specializes in the instruction of students with special needs and in the delivery of alternative and augmentative communication sources for students. She teaches students grade-level curricula with modifications for their communication and physical abilities and collects data on their individualized educational goals. She also monitors students’ progress, writes individualized education programs, and develops educational themes to teach grade-level curricula. Additionally, Ms. Clontz helps new employees become adjusted to their new positions, develops curriculum plans for students in preschool through high school, and teaches a sign language course for teenagers and adults. Ms. Clontz has nurtured an ever-growing skill set over the course of 19 years, and she has also learned that the most gratifying aspect of her career has been helping her students to become independent. She is a professional interpreter for the hearing impaired and she helps people to become more effective communicators. She is a recipient of the Executive of the Year Award, as granted by the State of North Carolina in 2009, and she has also been inducted into Madison Who’s Who and the Who’s Who Registry of Executives and Professionals. She is also an author of an article on a unique classroom project which was published in local newspapers throughout Mississippi in 2001. She became involved in her profession after meeting a bright young girl with severe and profound cognitive disabilities. She was inspired to help children with hearing impairments. Through it all, Ms. Clontz feels that her greatest career achievement is watching her students achieve growth and success.